Love Note #297: Guesses for the most sensory overload in Philly? Favorite Spot: Italian Market, but only by a little. I Am: A surface and textile designer on Boston’s Northshore (presently) who went to art school in Philly. I am: One of Leadership Philadelphia’s Emerging Connector’s and also a Creative Connector. My day job is Director of Operations for the Old City District and my night job is Cultural Liaison of Culture Works. I am on the board of Mural Arts, Flashpoint Theater Company and serve on various arts and culture committees. I am: I am a mechanical engineer, with a passion for cooking and I take my kitchen utensils/gadgets very seriously. My love note: Look at this stuff, isn’t it neat? Wouldn’t you think their collection’s complete? Look at this trove treasures untold how many wonders can one cavern hold? Looking around here you think sure, they’ve got everything. They’ve got gadgets and gizmos a-plenty. They’ve got whozits and whatzits galore. You want thingamabobs? They’ve got twenty! Alright, had to get that out of my system. Yes I like Disney songs too, but Disney doesn’t sell an 1800 watt stainless steel deep fryer that makes you want to let out a Tim Allen-esque grunt. Fante’s Kitchen Shop really does have everything, even a 3 ft pepper mill, and nothing says manly kitchen time like over sized cookware. I feel like a kid in a toy store when roaming the aisles, jumping from cutlery to cast iron cookware to meat grinders. For those of you who are more of the in-and-out type, the staff is very friendly and knowledgeable, allowing for well informed purchases of all of your cooking and baking needs. The store also has a rich history dating back to 1906, making it a great place to get some local culture. I am: I am a graduate student with a discerning palate and a taste for tea. My love note: I love The Spice Corner because it takes me back to a time in my childhood when everything around me seemed exotic. A time when I would sit in the kitchen with my mother pouring random ingredients into a bowl and pretending I was mixing potions. This small shop is packed with jars of fine spices, spice blends, dried fruit, flavored coffee beans and lots and lots of loose tea. I usually go in to replenish my stock of a particular tea but then quickly become mesmerized by the wall of tea and end up leaving with two or three teas that I haven’t tried before. The old-world feel of the shop, and the act of brewing an exotic tea allow me to recapture my days as a child alchemist. 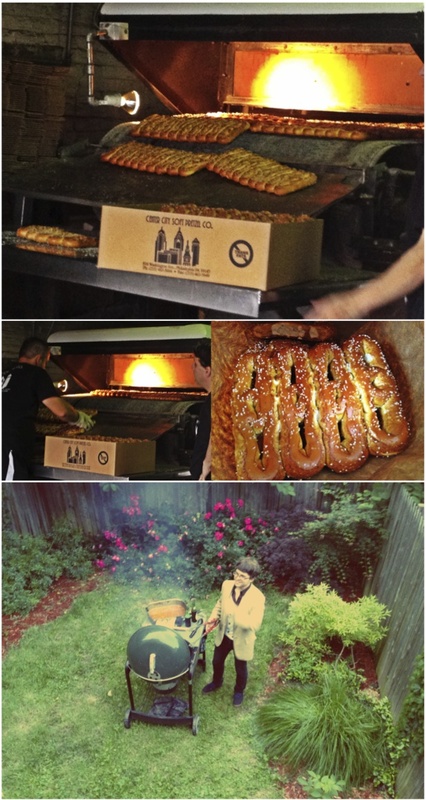 My love note: Center City Pretzels is where a piece of my childhood was baked. They’re only open from midnight–noon, the pretzels you buy are literally coming right off the conveyor belt (its a factory) for maximum heat and goodness, and they’re just 35 cents. Perfect for the wee hours of the night or morning.